This was (is?!) a pain. I wanted to shrink my image to fit on a smaller, or even same size card. When I use Win32DiskImager to make an image it wouldnt write the same image back to an SD card of the same size. The upshot is that you have to shrink the filesize of the image slightly. This is a Linux "live" CD, so when you write the ISO to a CD and boot from it, it gives you a virtual linux environment to run gparted in. I ran it in safe mode as it had a wobbly with drivers otherwise for me. 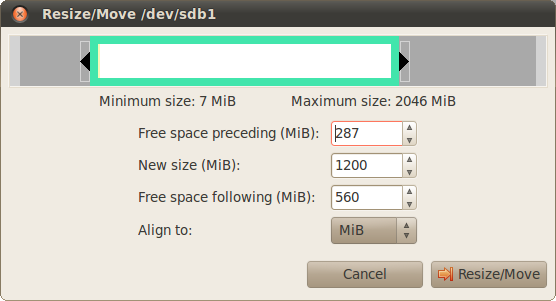 When in gparted, make sure you select the device that is the SD card (should be easy to tell by overall size shown). Resize your main (largest) partition by clicking on it and dragging the bar left to free up some space. This smaller size is what we will resize the image to. Remember to click Apply to make the change to the card. If this produces an error, try reducing the partition less (so leave less in the unpartitioned area). Write new image file from newly reduced sd card. This will output the structure and size of the image. 3) Then we resize the image with "truncate"
This then produces a smaller image filesize without overwriting a live partition. Then when you write that image back to an SD card and boot it, make sure to run raspi-config and extend the filesystem again. i have used your manual to resize the image from my 32GB sd card. only after the truncate when i have written the new image to an other card it didnt work(the rpi didnt boot). stil working on finding out what i did wrong. but i found an mutch faster way to make a image. since symantec has resurrected ghost, i used one of the latest builds (found online) and this worked just fine. it compresses the backup automaticaly and when writing back to any sdcard it automaticaly resizes the partitions. ghost runs just as a program on the computer and works on any windows system. Can you be more specific here? Is it just called Ghost, or in a suite of some kind? Do you know the version number? What's the file extension of the images it makes, or does it give you options on that?